Renowned for its focus on experiential learning, the CEM program is now enhancing the classroom experience. How? By bringing in seasoned industry veterans such as Victor Gervais, continuing lecturer and advisor, and Bowen Engineering’s founder to teach classes. Pro Bono Fellow: Shown here in the second week of classes of the fall semester, Bob Bowen is to step up to the lectern as the inaugural Donn E. Hancher Distinguished Fellow. Bob Bowen is the first to step up to the plate, or lectern, as the inaugural Donn E. Hancher Distinguished Fellow. His fall 2010 class, “Leadership & Advanced Project Management,” focuses on both the technical challenges of the construction industry and the managerial decisions needed to keep a project moving forward. Talk of the teaching fellowship began when some of Hancher’s former students, including Cliff Schexnayder (PhD ’80), Jeff Russell, P.E. (MSCE ’86, PhD ’88), and Anne Bigane Wilson (BSCEM ’79, MSCE ’81), set up an endowment in his honor. 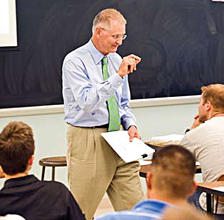 Bowen, chairman of the endowment committee and a major contributor to the fund, is teaching the class as a volunteer. A grand slam, Bowen believes, partly because of his lineup of other classroom speakers. Throughout the semester, he’s bringing several construction industry colleagues, including his first boss, Bill Brown, from W.M. Lyles Construction Co., and his own son, Doug Bowen, now president and CEO at Bowen Engineering. All share stories about leadership challenges. The Hancher fellowship will be a renewable, three- to five-year teaching appointment. The idea is to find someone retired, or even semi-retired in Bowen’s case, to share experience and knowledge with future leaders. Hancher’s impact on construction engineering and management field is unmatched, Hastak says. He advised more than 15 PhD students at Purdue, Texas A&M, and Kentucky, contributed to more than 100 scholarly publications, and led more than $3.5 million in funded research in the transportation area. Anyone interested in contributing to the Hancher endowment can contact Madonna Wilson, development director for construction engineering and management, at 765-494-6490 or wilson47@purdue.edu.